Food retailer Greggs set up giant coffee cups in London that doubled up as sleeping pods, to launch its coffee range and put a new scientific theory to the test. Scientists at the University of Pennsylvania have found that consuming a coffee, then immediately taking a 20-minute power nap, maximised alertness and increased productivity. 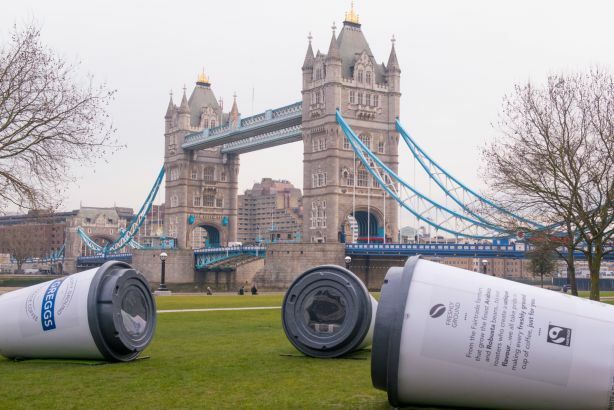 To launch its new coffee range Greggs teamed up with Havas PR Manchester, to put the theory to the test by constructing an outdoor laboratory in Potters Field, London, on Tuesday, and getting commuters to take part in a ‘Nappuccino’ study. Members of the public drank a Greggs coffee followed by a 20-minute power nap in a specially designed giant coffee cup pod, complete with a bed, blankets, cushions, mood lighting and relaxing music. Malcolm Copland, commercial director at Greggs, said: "A freshly ground cup of coffee helps many of us feel more awake so we wanted to test the science behind the coffee power nap to help the British public feel more alert and be more productive. "Perhaps it’s only a matter of time before we see Nappuccino sleeping pods popping up across the rest of the UK."